Tusk Trust - supporting forward-thinking and successful conservation intervention in Africa. Spinal Injuries Association - leading national user-led spinal cord injuries charity that is helping all those affected by spinal cord injury live fulfilled lives. Horatio's Garden - creates and lovingly cares for beautiful, accessible gardens in NHS spinal injury centres. The Bob Champion Cancer Trust - funding male cancer research at the Institute of Cancer Research. Breast Cancer Haven - offers free support, information and complementary therapies to anyone affected emotionally or physically by breast cancer and its associated treatments. The Tristan Voorspuy Conservation Trust - aiming to effectively and efficiently promote a sustainable equilibrium between the land, animals and people in Kenya. 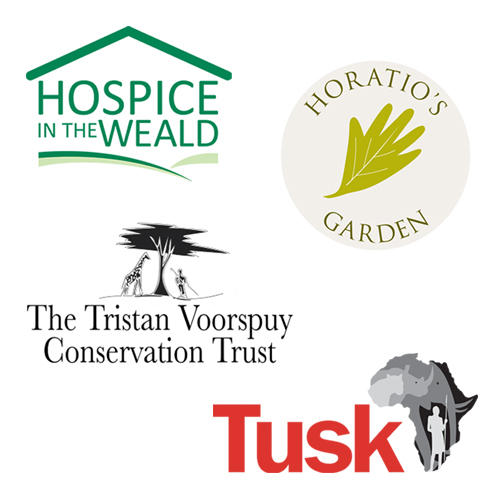 Friends of Sussex Hospices - support the running costs of the 12 hospice care providers serving the adults and children in Sussex. Hospice in the Weald - provides free care to patients with a terminal illness, their families and carers in West Kent and Northern East Sussex. We also support charitable events. Anything from a school raffle through to a fundraising ball or event: the UK Sponsorship Awards, The South of England International Horse Trials, The Silk Series, the Telegraph Business Awards. The facts speak for themselves and charitable giving is increasingly on the rise in the UK with the majority of the population having have donated in the past year. We believe that companies have a responsibility to be involved in charitable giving, too. By supporting valuable causes, companies have the opportunity to strengthen their corporate identity both in their communities and in the workplace itself. An ethical and trustworthy approach speaks volumes. Taking part in charitable events is also an excellent networking opportunity and can effectively widen your company's reach.